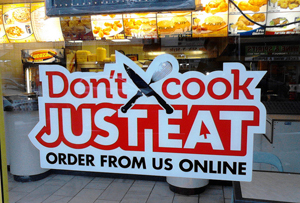 The online takeaway platform reported a 52% increase in orders for 2014. Last year Just Eat embarked on the biggest British technology IPO in eight years and today investors got some reassurance they were on to something good. The online takeaway business said that orders in 2014 were up 52% on the previous year and 50% on a like-for-like basis. The business allows hungry customers to order food from its tens of thousands of restaurant partners, taking commission of about 10%. In November it delivered its 100 millionth UK order and it also has a presence in Denmark (where it was founded) and 11 other countries. It said the growth was down to investment in marketing, staff and technology, and a shift from customers buying on computers to phones and tablets. Just Eat is currently in a battle to maintain its status at the top of the market as competitor HungryHouse ramps up marketing spend after raising £50m from investors last year. While it has by far the bigger share of the market and the first mover's advantage, the relative lack of unique IP means Just Eat could theoretically be disrupted by a more agile competitor at any time. These concerns don't appear to have held back any investors though. Just Eat's shares were up by almost 4% to 342.6p this morning. In August the company reported half-year revenues were up 58% to £69.8m and pre-tax profits up from £3.1m to £8.6m. If it can turn its full-year growth in to similarly strong financial figures then investors will have even greater cause for cheer.